Upheaval Dome Crater - The Upheaval Dome impact crater is one of the United States most famous impact structures due to its location within the boundaries of Canyonlands National Park, near Moab, Utah. The stucture is, according to the University of New Brunswick impact database, less than 170 million years old, about 10km in diameter, and exposed in sedimentary rock. The impact origin of each location listed on this website has been supported by unambiguous diagnostic evidence of hypervelocity impact that has been reported in a scientific (usually peer reviewed) context. Without such evidence, a geological structure is not a confirmed impact crater. This section, which is included for each crater on this website, is not an exhaustive list of such published evidence, but is meant to demonstrate that appropriate work has been done for each listing. Buchner, E., Kenkmann, T., Upheaval Dome, Utah, USA: Impact Origin Confirmed. Geology, v 36, no 3, p 227-230. 2008.
above abbreviated in open access Large Meteorite Impacts and Planetary Evolution IV (2008) conference abstract #3005. Other significant evidence: breccia, megabreccia, morphology. Boone J. D., Albritton C. C. Jr. (1938) Established and supposed examples of meteoritic craters and structures. Field and Laboratory, Volume 6, No. 2, pp. 44-56. Bucher W. H. (1936) Cryptovolcanic Structures in the United States. in 16th International Geological Congress, Washington, 1933, Report, Volume 2. Buchner E., Kenkmann T. (2008) Upheaval Dome, Utah, USA: Impact Origin Confirmed (abstract). Abstracts of the Large Meteorite Impacts and Planetary Evolution IV conference. Conrad P. G., Eigenbrode J. L. (2011) Upheaval Dome, an Analogue Site for Gale Crater (abstract). Abstracts of the Analogue Sites for Mars Missions: MSL and Beyond conference. Daly, R., 2010, Fracture styles at Upheaval Dome, Canyonlands National Park, Utah, imply both meteorite impact and salt diapirism, Master's Thesis, University of Idaho. Daly R. G., Kattenhorn S. A. (2009) Fracture patterns related to meteorite impact and subsequent salt movement at Upheaval Dome, Canyonlands National Park, Utah (abstract #112-3). Abstracts of the 2009 Portland GSA Annual Meeting, Geological Society of America Abstracts with Programs, Vol. 41, No. 7, p. 313. Daly R. G., Kattenhorn S. A. (2010) Deformation features at Upheaval Dome, Utah, imply both meteorite impact and subsequent salt diapirism (abstract #69-9). Abstracts of the 2010 GSA Denver Annual Meeting, Geological Society of America Abstracts with Programs, Vol. 42, No. 5, p. 172. Daly R. G., Kattenhorn S. A. (2010) Deformation styles at Upheaval Dome, Utah imply both meteorite impact and subsequent salt diapirism (abstract #1969). Abstracts of the 41st Lunar and Planetary Society Conference. Fiero G. W. (1958) Geology of Upheaval Dome, San Juan County, Utah. Master's thesis. University of Wyoming. Gay S. P. Jr. (2010) Upheaval Dome, Southeast Utah: The Evidence Ignored by Both Sides (abstract). Abstracts of the AAPG Rocky Mountain Section, 59th Annual Rocky Mountain Rendezvous. Geesaman P. J. (2013) Structural observations and stratigraphic variability in Jurassic strata, Upheaval Dome, Canyonlands National Park, Utah, USA. Master's Thesis, Colorado School of Mines, Golden, CO.
Geesaman P., Trudgill B., Hearon T. E. IV (2013) Structural observations and stratigraphic variability in Jurassic strata, Upheaval Dome, Canyonlands National Park, Utah, USA (abstract). Abstracts of the 125th Annual Meeting and Expo, Denver, CO., Geological Society of America Abstracts with Programs. Vol. 45, No. 7, p.372. Geesaman P. J., Trudgill B. D., Hearon T. E. IV, Rowan M. G. (2015) New Evidence for Long-Term, Salt-Related Deformation at Upheaval Dome, SE Utah (abstract). Adapted from oral presentation given at the AAPG Annual Convention & Exhibition, Denver, CO, 2015. AAPG Search and Discovery Article #10756. Herkenhoff, K. E., Giegengack, R., Kriens, B.J., Louie, J.N., Omar, G.I., Plescia, J.B., Shoemaker,E.M. (1999) Geological and Geophysical Studies of the Upheaval Dome Impact Structure, Utah (abstract). Abstracts of the 30th Lunar and Planetary Science Conference. Huntoon P. W. (2000) Upheaval Dome, Canyonlands, Utah: Strain Indicators that Reveal an Impact Origin, in Geology of Utah’s Parks and Monuments 2000, Utah Geological Association Publication 28, D. A. Sprinkel, T. C. Chidsey, Jr., and P. B. Anderson, editors. pp. 1-10. Huntoon P. W. (2005) Mesoscopic strain and stress indicators at Upheaval Dome, Utah, that support an impact origin (abstract). Abstracts of the Rocky Mountain Section - 57th Annual Meeting of the Geological Society of America, Abstracts with Programs, Vol. 37, No. 6, p. 4. Joesting H. R., Plouff, D. (1958) Geophysical studies of the Upheaval Dome area, San Juan County, Utah. in Guidebook to the Geology of the Paradox Basin, Sanborn A. F., editor, Intermountain Association of Petroleum Geologists, Ninth Annual Field Conference, 1958, pp. 86-92. Joesting H. R., Case J. E., Plouff D. (1966) Regional geophysical investigations of the Moab-Needles area, Utah.Geological Survey Professional Paper 516-C, Geophysical Field Investigations, U.S. Department of the Interior, U.S. Government Printing Office. Kanbur Z., Louie J. N., Chavez-Perez S., Plank G., Morey D. (2000) Seismic reflection study of Upheaval Dome, Canyonlands National Park, Utah. Journal of Geophysical Research - Planets, Volume 105, Issue E4, pp. 9489-9505. doi:10.1029/1999JE001131. Kattenhorn S. A., Daly R. G. (2011) Impacts into Salt Basins: The Role of Salt Mobilization in Crater Modification and Deformation (abstract). Abstracts of the 42nd Lunar and Planetary Science Conference. Kenkmann T., Ivanov B. A. (2003) The Upheaval Dome impact crater, Utah: Combining structural and numerical data to constrain age, diameter, and amount of erosion (abstract). Abstracts of the Lunar and Planetary Institute 3rd International Conference on Large Meteorite Impacts. Kenkmann T., Jahn A., Wünnemann K. (2006) "Block Size" in a Complex Impact Crater Inferred from the Upheaval Dome Structure, Utah (abstract). Abstracts of the 37th Lunar and Planetary Science Conference. Kenkmann T., Scherler D. (2002) New Structural Constraints on the Upheaval Dome Impact Crater (abstract). Abstracts of the 33rd Lunar and Planetary Science. Kenkmann T., Scherler D., Jahn A., Ivanov B. A. (2004) Anatomy of a central uplift of a complex impact crater: the Upheaval Dome structure, Utah (abstract). Abstracts of the GSA 2004 Denver Annual Meeting, Geological Society of America Abstracts with Programs, Volume 36, No. 5, p. 266. Koeberl C., Plescia J. B., Hayward C. L., Reimold W. U. (1999) Impactites at the Upheaval Dome Structure, Utah? (abstract). Abstracts of the 30th Lunar and Planetary Science Conference. Kriens B. J., Herkenhoff K. E., Shoemaker E. M. (1997) Structure and kinematics of a complex crater, Upheaval Dome, SE Utah (abstract). Abstracts of the 1997 Large Meteorite Impacts and Planetary Evolution conference, Lunar and Planetary Institute. Kriens B. J., Shoemaker E. M., Herkenhoff K. E. (1997) Structure and kinematics of a complex impact crater, Upheaval Dome, southeast Utah, in Brigham Young University Geology Studies, Volume 42, part II, Geological Society of America Field Trip Guidebook, 1997 Annual Meeting, Salt Lake City, Utah, Mesozoic to recent geology of Utah, edited by P. K. Link and B. J. Kowallis, pp. 19-31. Kriens B. J., Shoemaker E. M., Herkenhoff K. E. (1999), Geology of the Upheaval Dome impact structure, southeast Utah. Journal of Geophysical Research, Volume 104, Issue E8, pp. 18867–18887. doi: 10.1029/1998JE000587. Louie J. N., Chávez-Pérez S., Plank G. (1995) Impact deformation at Upheaval Dome, Canyonlands National Park, Utah, revealed by seismic profiles (abstract). Abstracts of the 1995 Fall meeting of the American Geophysical Union, San Francisco, EOS Transactions, Volume 76 (supplement). Mattox R. B. (1975) Upheaval Dome, a possible salt dome in the Paradox Basin, in Canyonlands Country, A Guidebook of the Four Corners Geological Society, Eighth Field Conference, Fassett J. E., editor, Canyonlands, Four Corners Geological Society, Durango, Colorado. pp. 225-234. McKnight E. T. (1940) Geology of area between Green and Colorado rivers, Grand and San Juan counties, Utah. U.S. Geological Survey Bulletin 908. Orr W. R., Schultz R. A. (2008) Review of faults associated with complex impact structures in sedimentary rock targets, with reference to the Upheaval Dome impact structure, Utah, U.S.A (abstract). Abstracts of the 39th Lunar and Planetary Science Conference. Orr Key W. R., Schultz R. A. (2009) Fault formation at impact craters in porous sedimentary rock targets (abstract). Abstracts of the 40th Lunar and Planetary Science Conference. Plescia J. B. (2003) Application of gravity data to understanding impact mechanics (abstract). Abstracts of the workshop, Impact Cratering: Bridging the Gap Between Modeling and Observations, Lunar and Planetary Institute, Houston, TX. Scherler D., Jahn A., Kenkmann T. (2003) Structural investigations in the central uplift of the Upheaval Dome impact crater, Utah (abstract). Abstracts of the Lunar and Planetary Institute Third International Conference on Large Meteorite Impacts. Scherler D., Kenkmann T., Jahn A. (2006) Structural record of an oblique impact: the central uplift of the Upheaval Dome impact structure, Utah, USA (abstract). Symposium "Tektonik, Struktur- und Kristallingeologie", Universitätsverlag Göttingen, p. 188-191. Schultz-Ela D. D., Jackson M. P. A., Hudec M. R., Fletcher R. C., Porter M. L., Watson I. A. (1994) Constraints on the Origin of Upheaval Dome, Paradox Basin, Utah (abstract). Abstracts of the 1994 American Association of Petrolium Geologists Annual Convention, Denver, CO.
Schultz-Ela D. D., Jackson M. P. A., Hudec M. R., Fletcher R. C., Porter M. L., Watson I. A. (1994) Structures formed by radial contraction at Upheaval Dome, Utah (abstract). Geological Society of America, Abstracts with Programs, Vol. 26, no. ?, p. A72. Shoemaker E. M. (1954) Structural features of southeastern Utah and adjacent parts of Colorado, New Mexico and Arizona. in Stokes, W. L., editor, Guidebook to the Geology of Utah, No. 9, Uranium Deposits and General Geology of Southeastern Utah, Utah Geological Society, pp. 48-69. 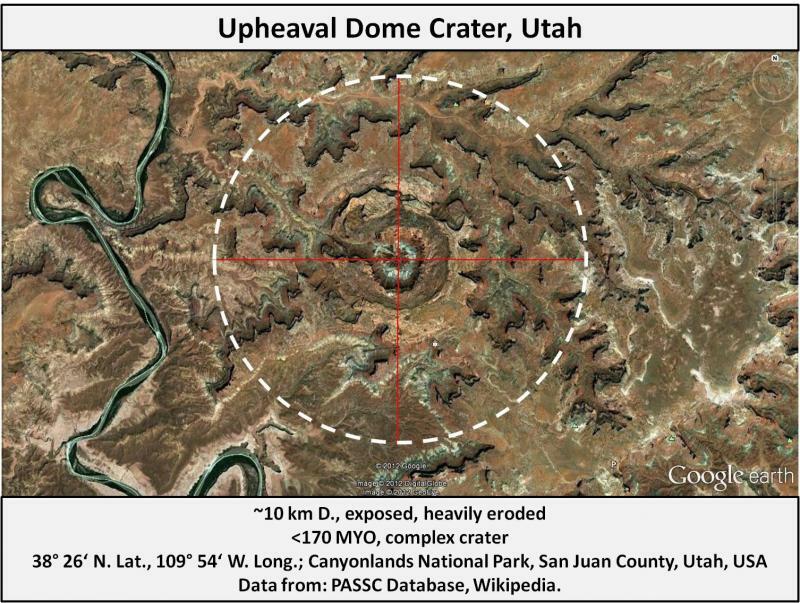 Shoemaker E. M., Herkenhoff K. E. (1984) Upheaval Dome impact structure, Utah (abstract). Abstracts of 15th Lunar and Planetary Science Conference, pp. 778-779. Shoemaker E. M., Herkenhoff K. E., Gostin V. A. (1993) Impact origin of Upheaval Dome, Utah (abstract). EOS Transactions of the American Geophysical Union, Volume 74, Fall Meeting Supplement, p. 388. Copyright 2011, 2012, 2013, 2014, 2015, 2016 United States Meteorite Impact Craters. All rights reserved.